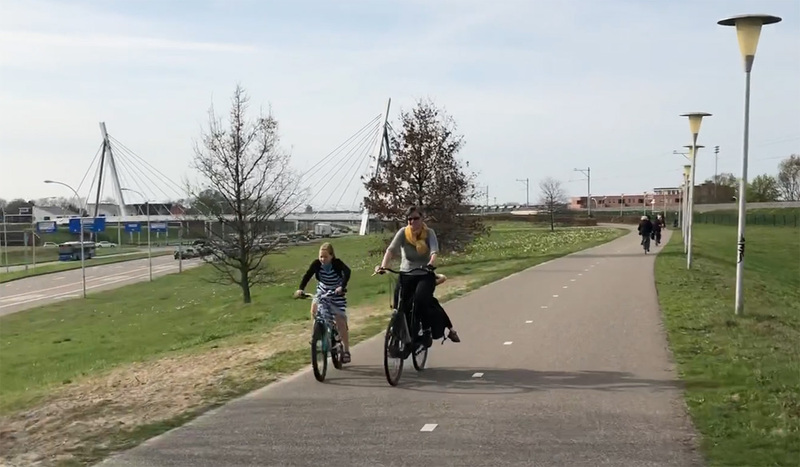 One of the maybe unexpected side effects of the Sustainable Safety policies is that flow roads, which – as the name suggests – can only be for the flow of (motor) traffic, become big flow roads and thus a barrier for cycling. For the non-Dutch eye these roads also often look rural, but that is because they are designed to be further away from buildings, homes and people. Where a cycle route does cross such a big urban flow road you need a big work of infrastructure. 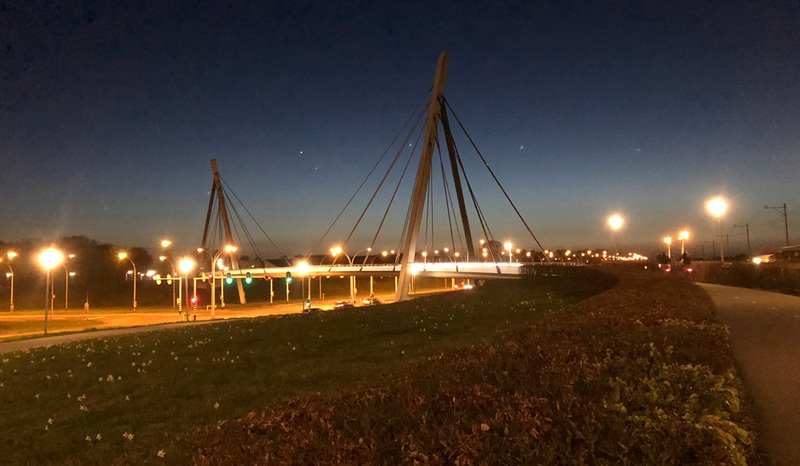 The Zwolle Westenholter Bridge is one such big piece of infrastructure, built at the same time as the huge road it crosses was reconfigured. The Westenholter Cycle bridge from the south-east. This aerial picture shows just how big the intersection is. There is no real alternative than to have a multi-level crossing here. Picture courtesy of Ma.an architects. The Westenholter cycle bridge was opened in September 2006. It connects the Zwolle city centre to the older urban expansion Westenholte with a population of 5,100. 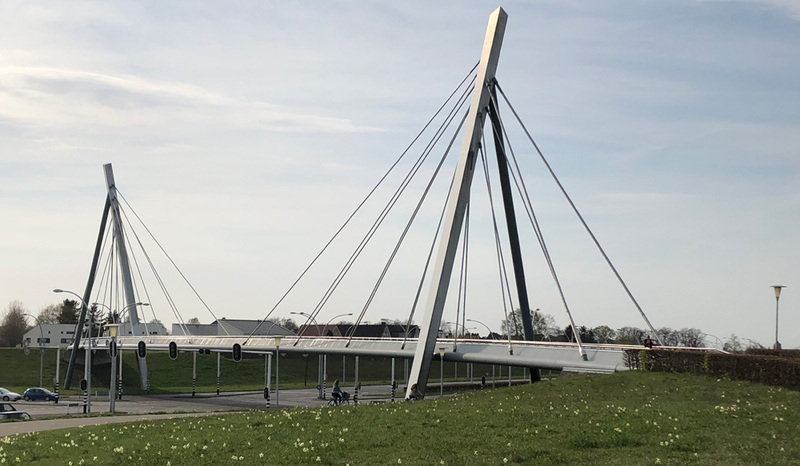 It is a bridge in the cycle route called Kamperpad, which connects Zwolle to the historic city of Kampen. (Name giving in this region is rather straightforward.) Westenholte was a village until 1967. Building new homes for Zwolle started in 1970. Together with the more recent and much larger urban expansion Stadshagen (pop. 17,000) and the former village of Spoolde (pop. 1,070), Westenholte forms the new part of the city called Zwolle-West, since 2012. The bridge is well-lit at night. 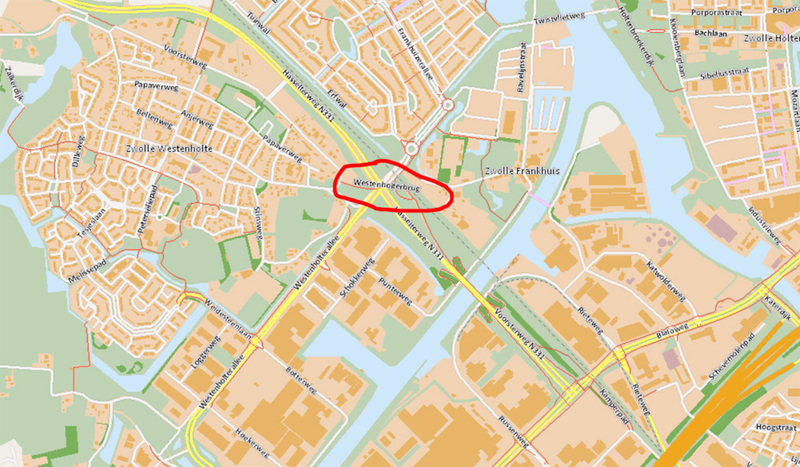 Although the location appears very rural in the video and pictures, the location of the bridge is actually quite inside Zwolle. Map from the Routeplanner from the Cyclists’ Union. 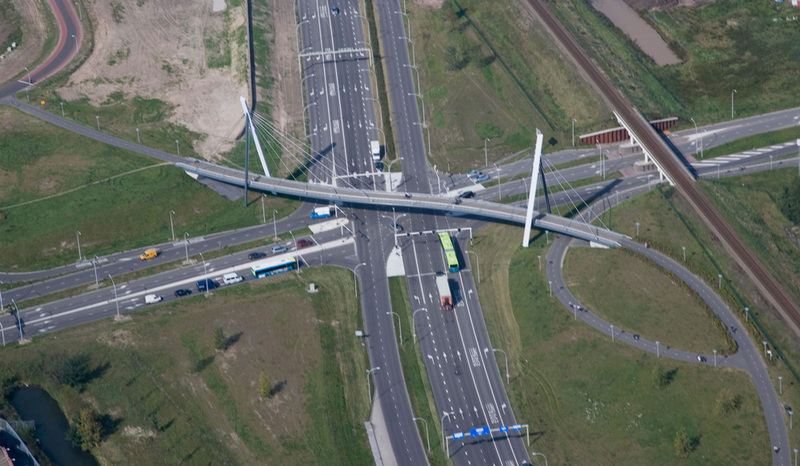 The Westenholterbrug is a steel cable-stayed bridge with two pylons that are leaning back. That was for aesthetic reasons, according to the architects, bureau Ma.an. It emphasises the forces working on the cables holding up the bridge’s deck. The bridge diagonally connects two cycle routes that are on either side of the major intersection for motor traffic. To make cycling across the bridge a nice experience the bridge was designed with an S-shape. This reinforces the a-symmetrical shape that was chosen for the pylons. The bridge can be crossed without having to slow down on your bicycle and yet the view from it changes due to the meandering route. According to the architects this changing view goes perfectly with the dynamics of the intersection below the bridge. 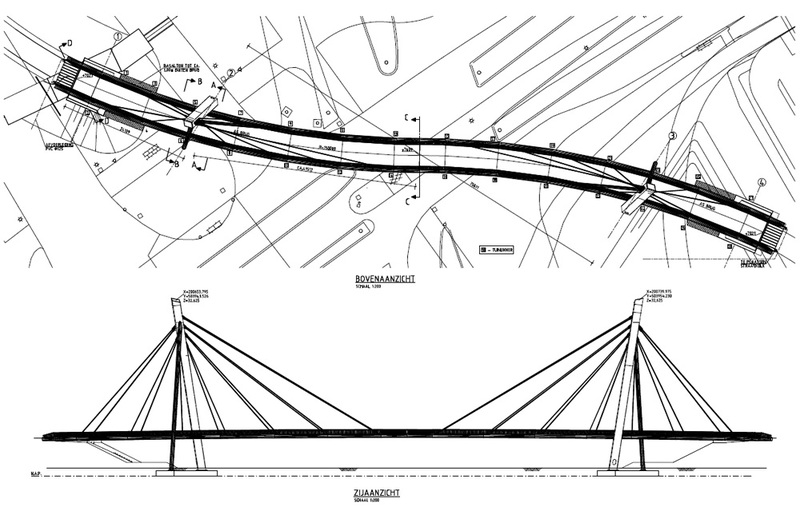 Blueprint of the bridge. Picture courtesy of Bouwen met Staal. 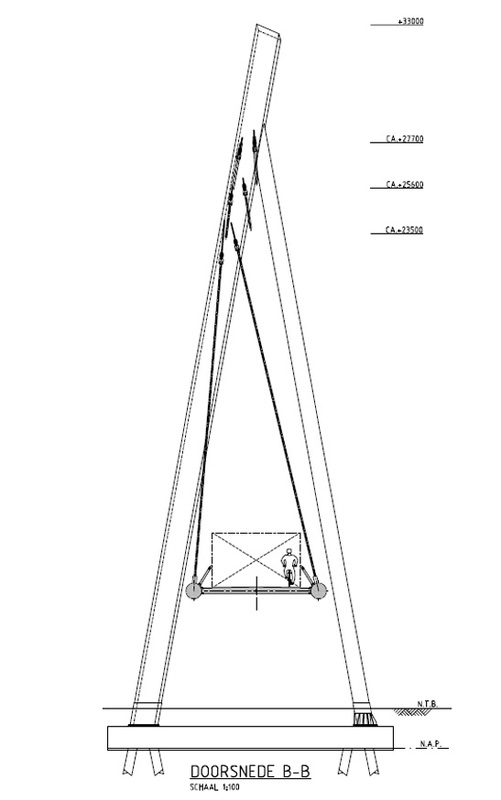 Cross section of the bridge with some measurements. Picture courtesy of Bouwen met staal. The leaning pylons are 33 metres tall, with 28 cables they hold up the circa 4-metre-wide bridge deck, that is also about 4 metres above the road. The S-shape of the deck is very clear on the blueprints. One side of the railing has integrated LED-lights. Halfway on the 130-metre-long bridge the LED lights switch to the railing on the other side. The current lights were placed in 2016, that was most likely to replace the original 2006 lights with a more modern version. The bridge deck is 4 metres wide. Wide enough for a comfortable bi-directional cycleway. This east access is almost level as the cycleway on this approach is on a dike that is almost on the same height as the bridge deck. The almost straight access ramps on either side make the total length of the bridge 510 metres. The inclines on either side are very friendly. Since the road is lower than the cycle route, because that is on a ridge, the height difference is only 3 metres. The west-access gradient is therefore a mere 1.74%. There are two approaches on the east side, which is the city side. One access stays on a dike and the incline on that approach was not investigated. The other approach goes under the bridge with a curve and then under the railroad Zwolle-Kampen. This is a steeper approach with a gradient of 2.02% on average, but with one point where it is 5.7%. That is over the current Dutch standards advising gradients should not be over 5%. Fortunately, it is only a very short part where that is the case. The researchers investigating the gradients note that the users of the bridge are very content with the access ramps. Some even indicate they prefer this bridge over another route that has a bridge with steeper inclines. The east access that curves under the bridge is steeper. At one point even steeper than the guidelines accept. Since that is only for a short stretch people generally appreciate the access ramps. 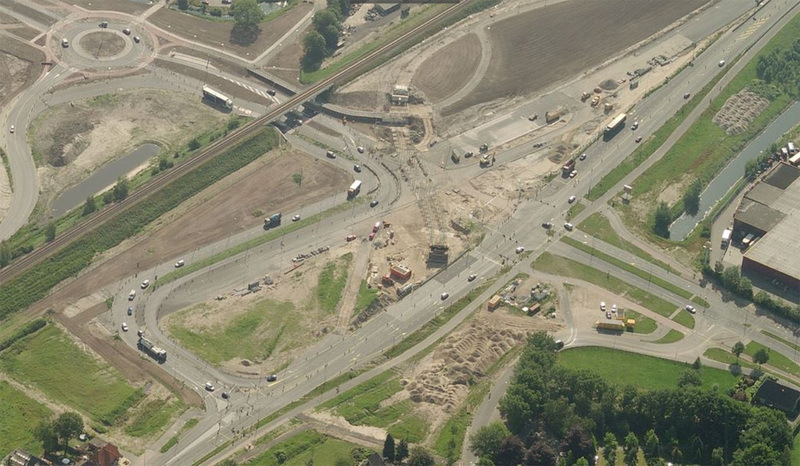 Bing Maps shows the location during construction. You can see that the reconstruction of the intersection and the construction of the bridge happened at the same time. I filmed this bridge during the evening rush hour on a beautiful day in mid-April 2018. As usual in my videos you can see a whole range of different people using the bridge. Children returning home from after school activities. People returning from work and shopping, but also racing cyclists in lycra who had just started an evening tour. 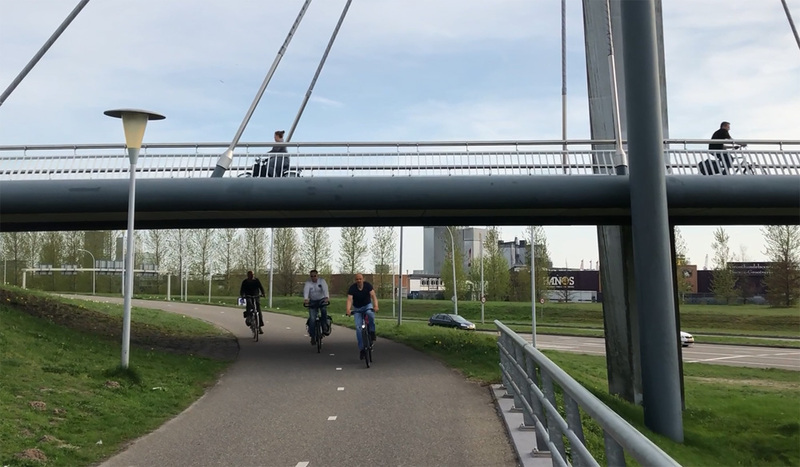 My video about the Westenholter cycle bridge in Zwolle. Rides across from the two different east approaches. What a nice-looking bridge, moreso in the daylight than the dark as the supports look juuuuust right. And putting the s-curve in it, to give a chamging view of the surrounding countryside, shows a wonderful thoughtfulness to locals who will probably make over 10,000 journeys over it in their lifetime. Certainly avoids the grinding experience of climbing a long ramp and then having to ride dead straight for a few hundred metres (into the wind, always!) on the bridge itself. 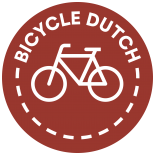 If anything could be considered to be “Dutch cycling culture” then perhaps this empathetic aspect of.the designers is it. I also liked the light to dark to light videography. A similarly nice touch to the frequent viewers.of your videos. After the horrific crash of a pedestrian bridge in the USA I became even more curious. Do you know how much the bridge itself cost? Do you know how long the main span is. Was traffic interrupted during the building? Regarding the question whether traffic was interrupted during the building: One of the captions says “You can see that the reconstruction of the intersection and the construction of the bridge happened at the same time.” So at the time the bridge was built, there wasn’t any traffic to interrupt yet. When the first traffic used the intersection, the bridge was already there. 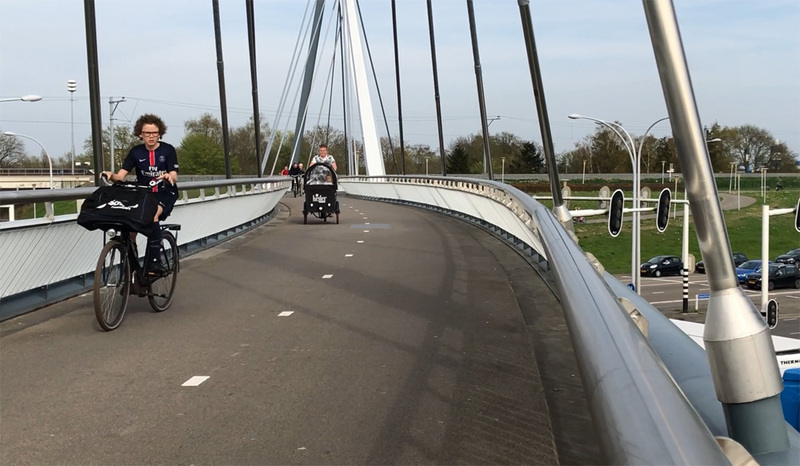 This entry was posted on 22 May 2018 by Bicycle Dutch in Original posts and tagged big bridge, exceptional cycling infrastructure, Zwolle.